Goodness, Gracious, Great Balls of Wool! 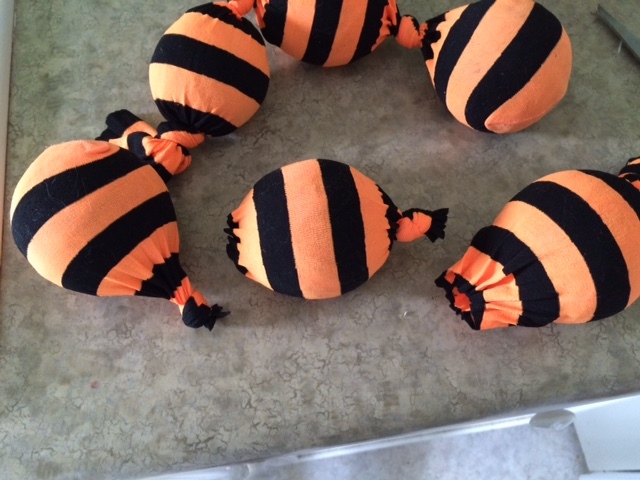 Back a couple of months ago, I read an article somewhere (I can’t remember where) about using balls of felted wool in the dryer to decrease drying time and soften laundry. The premise behind this is that the balls tumble around the dryer, break up and separate the wet clumps of clothes, and thereby speed the drying process. Since our dryer has recently been rather temperamental, I thought that anything that I could do to help it along would be great. Not to mention the possible energy savings from shorter dry cycles. Of course, I prefer to dry my laundry on the line when I can, but even then I usually bring the dried laundry in and run it through the dryer for five or ten minutes to remove the stiffness. Lately, it has been so cold that the laundry has frozen on the line, which makes it very stiff and scratchy when it finally dries. So a good tumble in the dryer is just what it needs to soften it up. In the past, I have used tennis balls in the dryer when I dry my down jacket or sleeping bag, but I never really liked the idea of having heated rubber balls in the dryer with my clothes. So I really jumped on the idea of wool balls for this purpose. The fact that my “regular” laundry would benefit from them as well was just icing on the cake! So I headed to the craft store, where I had 50% off coupons, and picked up three skeins of 100% wool yarn in some pretty, variegated colors. 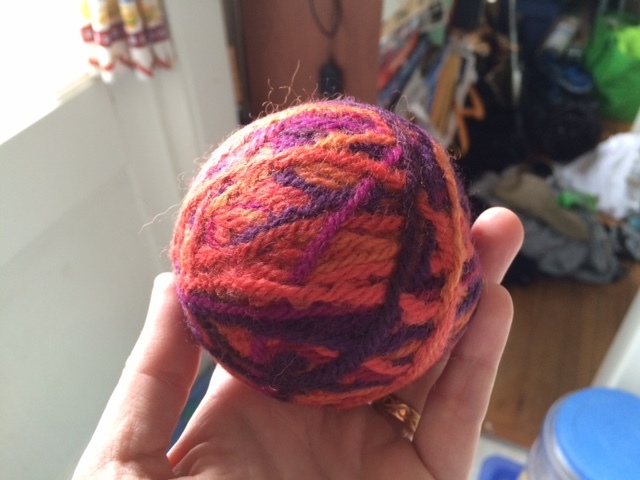 Each skein was enough to make two wool balls. 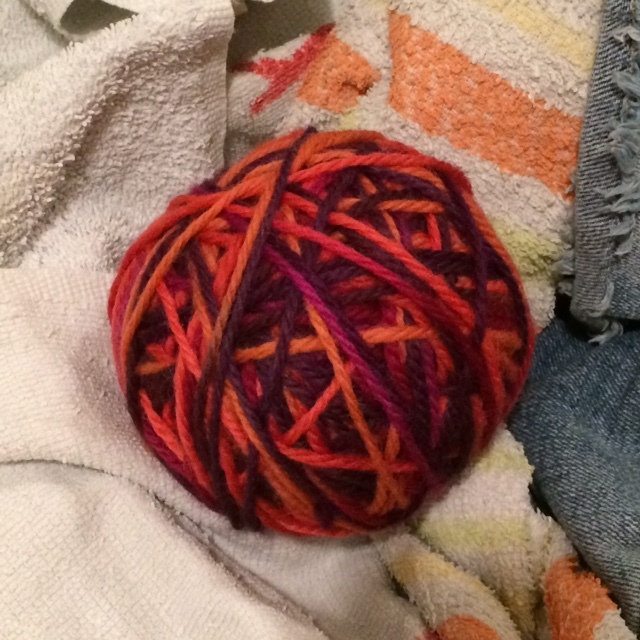 I simple pulled the yarn from the skein and rolled it into a ball. The next step called for placing the balls into a pair of pantyhose. 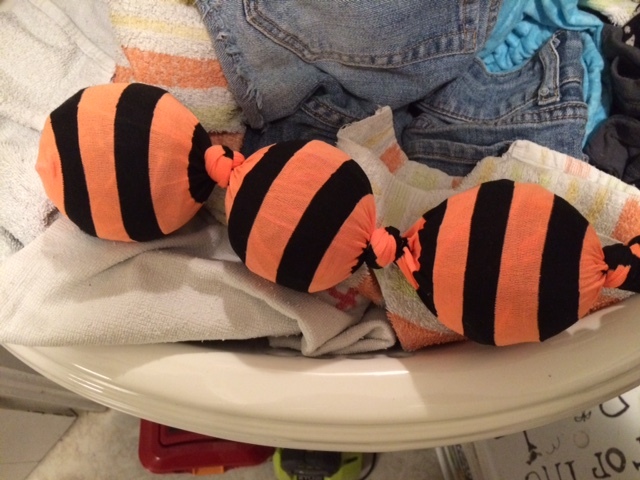 Since I don’t wear or own pantyhose, I instead repurposed my daughter’s orange and black pantyhose, left over from a Halloween costume, that were slated for donation. I cut both legs off the hose. Then I placed a ball into the toe, tied a knot, then put in a second ball, and tied another knot, and so on. I was able to get three balls in each leg. … and washed them, with just a few drops of detergent, on the hot cycle. Then I put them into the dryer with some towels on a medium high heat setting. 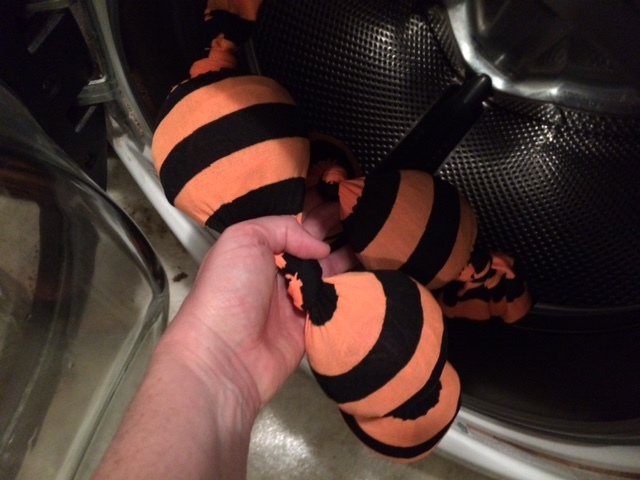 I ran into some difficulty at this point as the weight of the wool ball caterpillars kept knocking the door of the dryer ajar and halting the drying cycle. After they seemed to be mostly dry, I cut the balls out of the hose. And look how pretty they look, all nicely felted! I put the the balls into a pretty little metal bucket that I found while cleaning out the cabinet above my refrigerator, and placed the bucket in the laundry room. 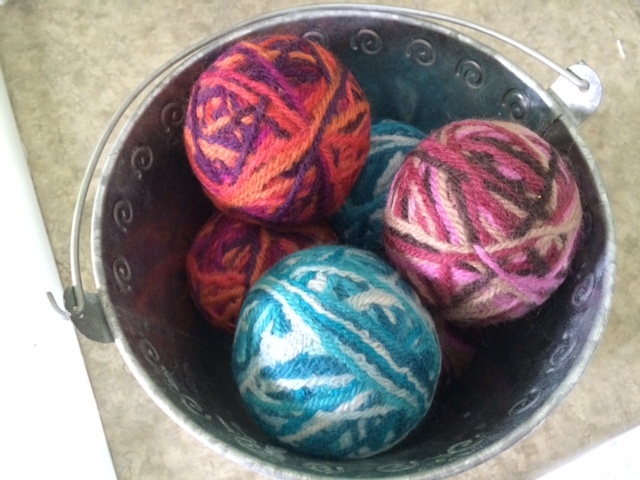 We have been using the the wool balls in the laundry ever since, and they do seem to decrease the drying time. But beware! I washed and dried my down jacket yesterday, and when I put it on this morning, three of the balls had hidden themselves in the jacket sleeves! Mischievous little rascals! I am trying to reduce or completely eliminate our use of dryer sheets, and I am hoping the felted wool balls will help. My next experiment is to place a couple of drops of fragrance oil inside one and see if it makes the laundry smell pretty! You are ingenious. I have been using wool balls (that I had bought through an organic co-op I used to belong to) for 3 years but I haven’t noticed ANY reduction in the clothes’ drying time, to be honest. Maybe I’m not using enough of them (only 3 at a time even though I usually dry large loads). What had improved my dryer’s electrical performance, however, has been to 1) hang my undies/socks/polyester clothing/washing cloths/cloth napkins on racks (I use vinegar as the softener but our water is so hard to start with that all the cotton clothing still needs to be dried in the dryer for it to remain soft) and 2) to use the Auto Moisture Sensing setting. 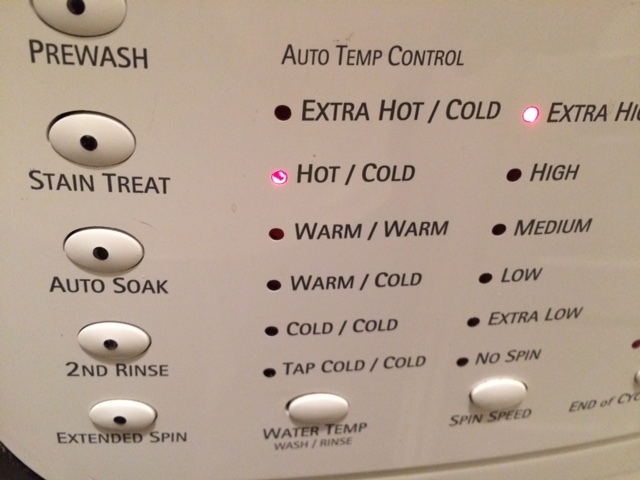 I honestly never noticed that I had that setting on my dryer until last year and I’ve had the dryer for… 13 years? yikes. I tended to over dry my clothes before since I only dry large loads and we have humid weather here in Central Florida so doing those 2 things definitely has helped. Good luck with your dryer balls, though, they are gorgeous! Thank you! I also recently rediscovered the auto-dry setting. I try to line dry things if I can, but just like you, we get some pretty humid summers. There are also some things that I like to dryer-dry, at least a little. I noticed while our dryer was out-of-commission that I did NOT enjoy line-dried undies! LOL! But pretty much everything else, I am OK with.